One of my top favorite things to do besides garden of course? Write posts for this blog. You know life is over-the-top when several weeks go by with no post. I’ve been a negligent blogger. My most faithful reader–my wonderful father-in-law, Steve–sent me a text message the other day that made me sad AND made me want to hug him at the same time. So, now that I have a moment to post, I would like to tell you animal lovers about something wonderful that Steve and his wife, Lisa, did. Yesterday, their neighbors found a kitten in the woods near their house in Maine. They couldn’t keep the kitty, so they brought him over to Steve and Lisa. Instead of bringing him to a shelter or saying no, the St.Hilaire’s took him in as a new addition to the family. One less kitty in a shelter! 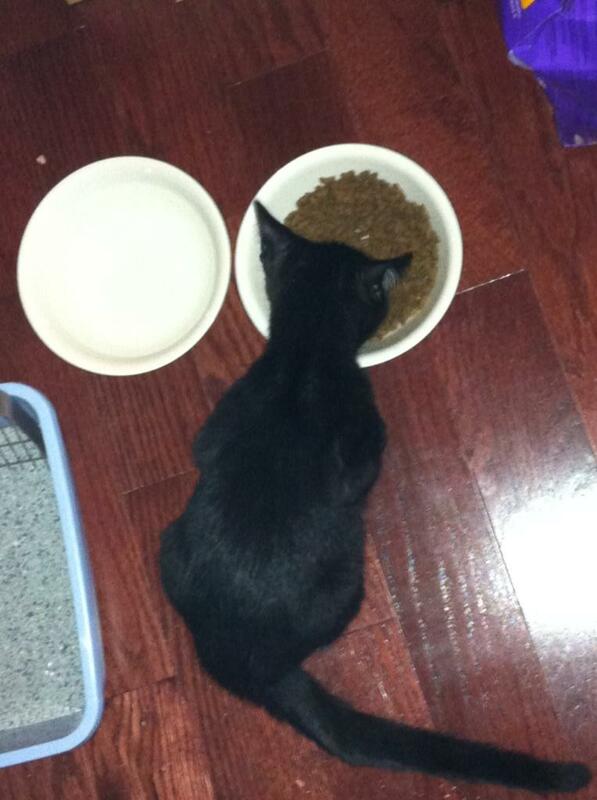 Here is a cell phone photo of the kitty eating a healthy indoor meal, safe from the dangers of the wild. I’ll score more photos soon that show this sweet baby’s face. They named him Sebastian (aka Spaz). Check out that long tail! Speaking of wild kitties, we have an extra cute one in our yard pretty much every day lately. I am pretty sure he is owned by someone nearby because he is a love bug and appears to be well-fed. However, I just don’t understand why people so carelessly take care of their animals? This poor kitty was hanging out under our compost bin while trying to dodge a light drizzle. This is extremely irresponsible of his owners in an urban-ish area like mine. 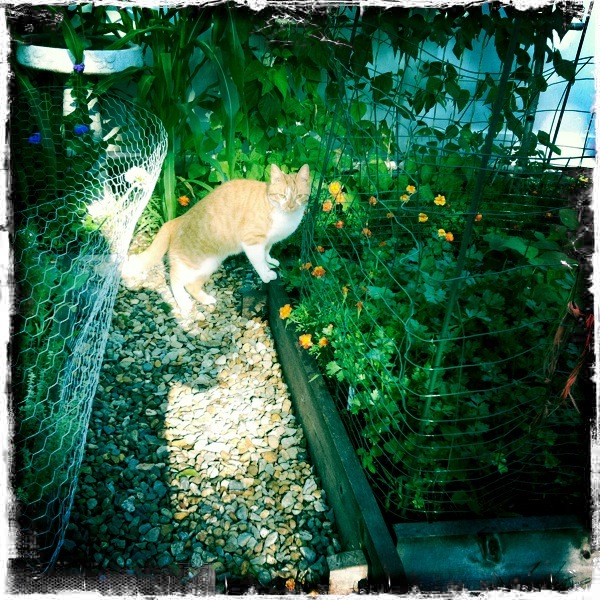 Thankfully, people like my father-in-law have big hearts and gave an adorable young cat a shot at a really good life! Little Sebastian is no doubt eating a big dinner or maybe getting pampered with a belly rub as I write this.